Yield Engineering Systems, Inc. (YES) announced they will be exhibiting and presenting at the Lab on a Chip Microfluidics & Microarrays World Congress 2016 being held September 26-28, 2016, at the San Diego Marriott Mission Valley in San Diego, California. This established conference in its 8th year brings together researchers and industry participants, discussing the innovative developments in the Lab-on-a-Chip (LOAC), Microfluidics, and the Microarrays Spaces. YES will be located at Booth #E24, promoting their YES-ÉcoCoat Silane Vapor Phase Deposition System. On October 18-19, 2016, YES will be exhibiting at the 13th Annual International Wafer-Level Packaging Conference (IWLPC). 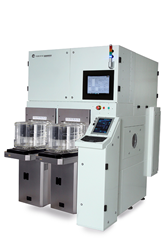 IWLPC brings together some of the semiconductor industry's most respected authorities addressing all aspects of wafer-level, 3D and MEMS device packaging and manufacturing. IWLPC is being held at the Doubletree by Hilton in San Jose, California. YES will be located at Booth #15, promoting their flexible tools for Wafer Level Packaging (WLP) and Fan-Out Wafer Level Packaging (FOWLP) type processes which offer increased performance, small footprint and low-cost of ownership. The YES-VertaCure and YES-450-PB Series dielectric vacuum cure ovens are used for polyimide, PBO and BCB cure applications.